Who: Western (0-7, 0-3 Class 3A Sunset) vs. Pahrump Valley (4-3, 3-0). Peter Davis/Special to the Pahrump Valley Times Pahrump Valley senior Caleb Sproul's helmet is a bystander as the Trojans listen to coaches at halftime of a game against Democracy Prep on Sept. 21 in Las Vegas. When/where: 7 p.m. today, Oct. 12, Trojan Field, Pahrump Valley High School. 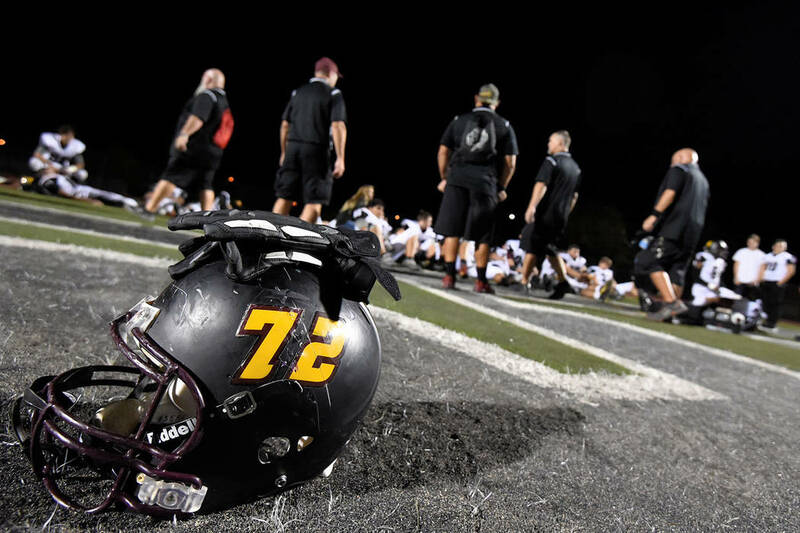 Last week: Western lost to Cheyenne 63-0; Pahrump Valley defeated Del Sol 27-14. Last season: Pahrump Valley defeated Western 40-6. Next week: Western vs. Democracy Prep; Pahrump Valley at Valley. About the Warriors: There just isn’t much to say. Western is a downtrodden football program. The Warriors have been in the Class 3A Sunset League since 2012, and their combined record is 2-59 overall, 0-37 in the league. That’s right: The Warriors have not won a single Sunset League game in six-plus seasons. The last time a coach lasted more than three years at Western was Brian Murray from 2004-07, which are the Warriors’ last four playoff appearances. This season, Western has scored just 26 points in seven games while allowing 360. Desert Oasis, Virgin Valley and Cheyenne all scored at least 60 points against the Warriors. On offense, Western quarterbacks have thrown for 527 yards and one of them, Hahsaun Blackburn, is the team’s leading rusher with 313 yards and two of their rushing touchdowns. Western has not thrown a touchdown pass this season. Pahrump Valley, a run-first, run-second and run-third team, has thrown six. A win keeps the Trojans perfect in the Sunset League and in line for a first-round playoff bye and, looking toward that, expect some of their horses to get some rest, at least as much as the thin roster will allow.